In August and October 2018, the London Bubble Theatre Company ran drama workshops in partnership with Our Time for young people aged ten and over whose parents have a mental illness. Over the week, the young people created characters and explored themes relevant to their lives, including young people’s relationships, school, family, police and financial issues. The young people weaved in some of their own skills, including dance, music and spoken word. The week of workshops ended with a group performance by the young people for family and friends. Many were struck by the depth and thought that went into the young people’s performances and how much of their own lives and experiences had been put into the characters. The young people reflected on the friendships they’d made and thanked the Bubble staff for helping them to develop their skills and characters. This is the first project of a three year partnership between Our Time and London Bubble. 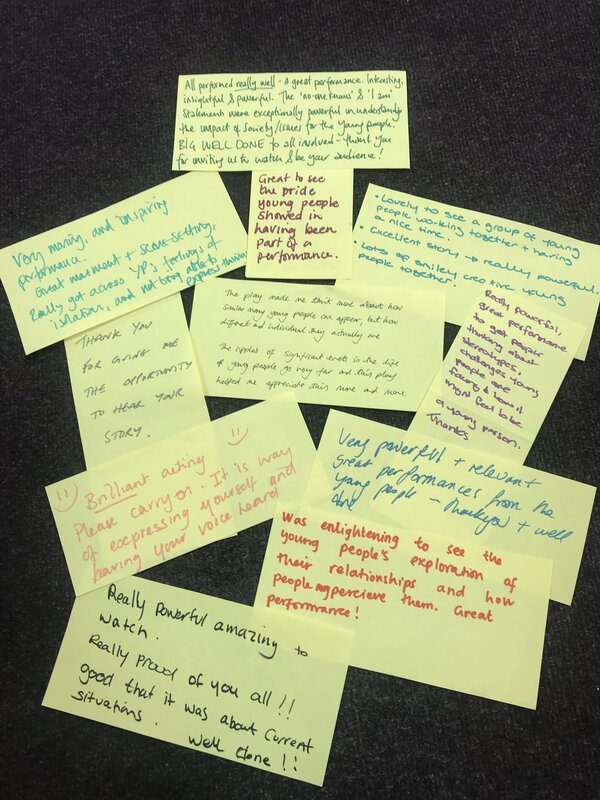 Here you can see some feedback from parents for London Bubble’s October half term workshops, which were carried out in partnership with Our Time, SpeakerBox and Power2.